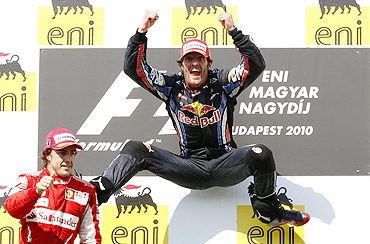 Australian Mark Webber took back the Formula One championship lead from Lewis Hamilton on Sunday after snatching victory in a Hungarian Grand Prix that Red Bull teammate Sebastian Vettel had been favourite to win. McLaren's Hamilton retired with a suspected gearbox failure, only his second blank this season, and dropped to second place overall, four points adrift. 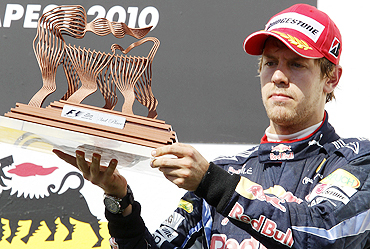 Vettel, starting on pole position for the seventh time in 12 races but again failing to convert the advantage, fell foul of the safety car rules and finished third behind Ferrari's Fernando Alonso. 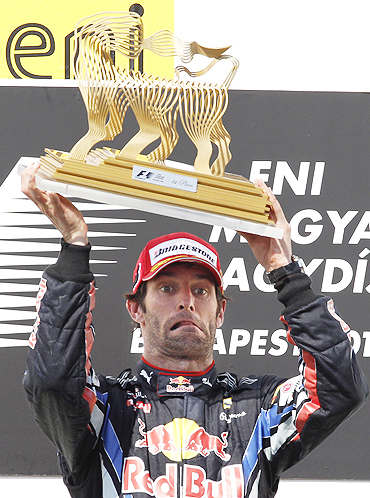 Webber now has 161 points to Hamilton's 157, with Vettel on 151 and McLaren's world champion Jenson Button on 147. In one of the closest battles in years, Alonso has 141. "I went through turn one and basically lost drive," he told BBC television. "I think the gearbox went. That's motorsport. When you push cars to the limit these things can happen. We've lost a lot of points today." Webber, celebrating his fourth win of the campaign, did everything right after going against the flow and staying out when the other frontrunners pitted for fresh tyres when the safety car was deployed on the 15th of 70 laps. His hopes were handed a massive boost when the stewards then slapped a drive-through penalty on Vettel for a safety car infringement, which dropped him behind double world champion Alonso. While Vettel cruised through the pitlane shaking his fists in the air with obvious rage at the officials, the Australian streaked away to build up a sufficient advantage to pit and retain the lead. Button had a miserable start and languished in 14th place until the safety car deployment, due to debris on the track, triggered chaos in the pitlane and allowed him to get into the points. The Briton, who had pitted before the safety car, finished eighth - and lapped. Mercedes's Nico Rosberg was released from his stop with a loose wheel that then bounced high among the mechanics as cars were coming in. In the mayhem, with a Sauber mechanic luckily catching the wheel, Renault's Robert Kubica drove into Force India's Adrian Sutil - fortunately without injuring any of the pit crew. Kubica, in what amounts to a home race for the Pole, was handed a 10-second stop-go penalty with a further investigation to be held after the race. Renault teammate Vitaly Petrov came good for the team, however, with the Russian rookie chalking up his best result in fifth place. 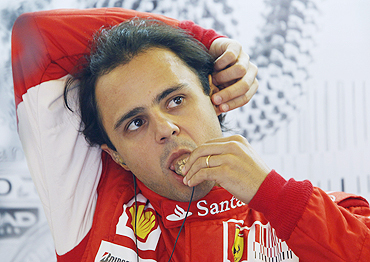 Ferrari's Felipe Massa, back in Hungary a year after an accident that nearly killed him and ended the Brazilian's season, was fourth. Germany's Nico Hulkenberg was sixth for Williams, with Spaniard Pedro de la Rosa collecting his first points of the season for Sauber in seventh. Japanese team mate Kamui Kobayashi was ninth and Brazilian Rubens Barrichello 10th for Williams after passing former Ferrari teammate Michael Schumacher despite the German pushing him perilously close to the wall. The incident was under investigation by stewards.